December 19, 2013 — Astronauts preparing to spacewalk outside the International Space Station are outfitting their spacesuits with an unusual device: a makeshift snorkel. 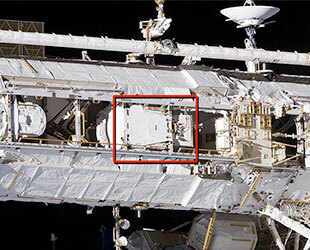 The astronauts, whose task it is to repair a critical cooling system necessary for keeping the outpost fully powered, have an additional concern to the "normal" challenges of a quickly-planned extra-vehicular activity (EVA, spacewalk). There is also a slight possibility their helmets could flood with water. During the last spacewalk to use U.S. spacesuits in July, Italian astronaut Luca Parmitano had to quickly retreat to the station's airlock when a leak inside his suit's plumbing enveloped his head in water. Since then, NASA engineers and the astronauts on board the space station have been working to identify and fix the problem. With no gravity to pull the water down into his spacesuit, the water pooled in front of his eyes, in his ears and nose, and near his mouth. Until his helmet could be removed back inside the re-pressurized airlock, there was nothing Parmitano could do about it.Mastracchio and Hopkins won't face that issue thanks to the addition of a 20-inch-long (50 centimeter) tube running from the front of their helmet down to their midriff. A modified absorbent pad designed to be installed on the back of the crew member's helmet, the HAP will capture any water leaking into the helmet. By leaning back onto the pad, Masstracchio and Hopkins will be able to gauge how much, if any liquid, is leaking. As soon as the crew member senses the "squishiness" in his HAP, that is a sign there is a problem in the suit and it is time to come inside, Bollinger said.